I’m doing it again. Smacking myself on the side of the head because it’s too panicked and busy in there, a snarl of thoughts that go nowhere and that I’m desperate to have stop. I’m stuck stuck stuck, but thwacking doesn’t help. We’re each of stuck in our heads, listening to the jabber of our mind. Musing, browsing, processing thought. Buffeted by feeling, crowded by anxiety. The internal monologue is a hellishly lonely, noisy phenomenon. At least now I have an image for that monologue. It’s not a state that’s easy to stage, and especially to dance. How does that mental scrawl find choreographic form? 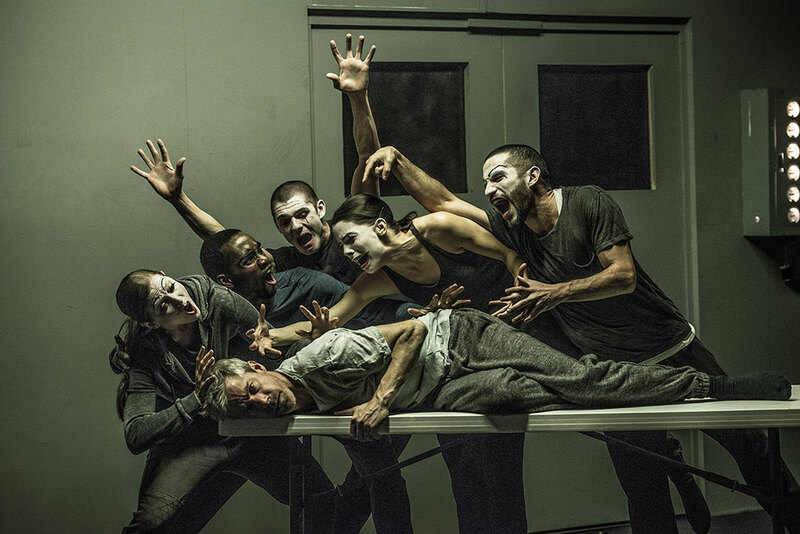 One of the incredible things about Betroffenheit, by Canadian choreographer Crystal Pite and theatre artist Jonathon Young, is that it finds a way of imaging that frenzied process. The piece by Kidd Pivot and Electric Company Theatre premiered in Toronto last year and visited Sadler’s Wells for just two midweek performances, though it’s scheduled to return next spring. Its origins are in a terrible personal tragedy – Young’s daughter and two of her cousins died in a fire, and Betroffenheit (which means a state of unspeakable trauma) is on one level about grief, addiction, and the recovery from both states. What does the mind look like here? A bare, grubby room, an unkempt echo chamber in which the mind warehouses its distress. It’s spare, but full of voices, all of them Young’s. He himself is the central figure – he voices all the text, much of it pre-recorded with an unnerving, fuzzy intimacy, though it seems to come from inanimate objects (doors, phones, alarms) or from the other dancers, a surroundsound hallucination of the self spread thin. He’s a great mover, but not as polished as the five dancers who blare in, embodiments of his distraction. Pite has explained that the dance interruptions represent addiction – a diversionary spectacle to drown out the misery, creaing its own narrative of alarm. The dancers pizzazz in like cabaret artistes, all ostrich plumes and crowd-pleasing sashay, crosstalk comics and heavily-powdered clowns. Distraction appears as vaudeville, leeching on its host like a poison in the blood. It’s a brilliant choice, because the point of a vaudeville act is that it doesn’t go anywhere, merely repeats itself for as long as it gets bookings. Think of Mama Rose in Gypsy, inflicting the grim cavortings of ‘Let Me Entertain You’ on audiences from Tulsa to Topeka. The shtick is stuck – a repeatable commodity, on any bill, in any theatre. It’s what Young needs, but it’s the worst thing for him. There’s clearly a comfort from slapping on a wig and the MC’s bright blue suit, twinkling his talk, sloping deftly over the stage. Routine razzledazzle stops him thinking, for a while. But what holds him up also holds him back. He’s stuck in a groove, repeatedly assailed by figures who at first seemed entertaining and become increasingly unendurable. In the second half, we’re out of the room and somewhere subterranean – the subconscious as underground car park, perhaps. The repeated lines and scenes, sometimes emerging as non-verbal vocalisations, suggest a mind unspooling. It’s not the meaning, it’s the mess, the fact that this yabber is happening at all. Pite’s dancers, meanwhile, perfect a marionette shuttle of breathtaking fluidity – they move in a stream of minute stages, like the smoothest stop-start animation. Even as they convey damage, they suggest a longed-for state of grace. Worry makes us human. Pite and Young offer a vision of consciousness as a constant juggle of anxiety, and the trick of surviving is to somehow manage it without self-harm. In a moment of sumptuous rest late in the piece, Young approaches Jermaine Maurice Spivey, a quicksilver dancer who has perhaps represented an alter ego (playing his partner in the cross-talk act). Young reaches out and gently holds his head with both hands, one on each side – a devoutly welcome act of calm. I felt its balm even from row L.
Eventually, everyone but Spivey leaves the stage. Young achieves the holy grail of modern therapy, moving on, taking his inner voices with him. I felt an odd pang of grief at this, only to recognise how much I’d invested in the work’s scratchy energy; Young’s stasis had become our entertainment, our own distraction from melancholy. Only Spivey’s abandoned final solo remains, a remnant of unsoothable anxiety. You never uproot the frets entirely: but calm, quiet, momentum. How blissful would that be?